There are those who say Zanzibar provides the best possible finish to a safari stint in Tanzania�s eastern highlands; and then there are others who profess that you should start your holiday on the pristine beaches of the island before heading off on a trekking adventure. It�s a moot point, really, and the main thing is to ensure that you do make your way to Zanzibar � no matter where it fits into your itinerary. The second consideration should be time, as good things cannot be rushed. 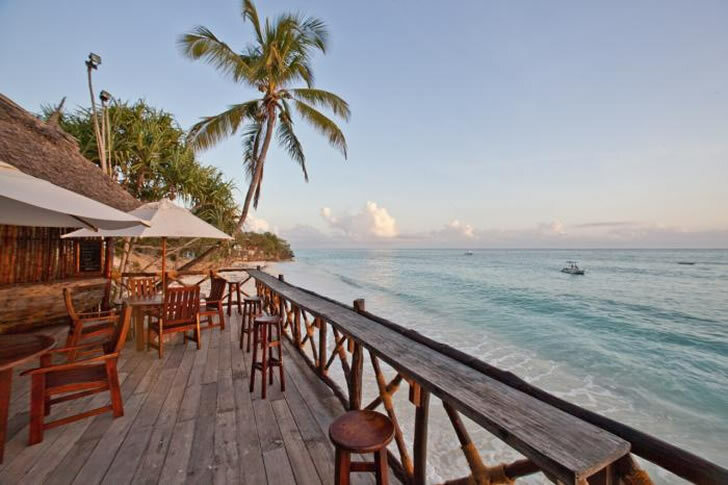 Ideally, two days should be set aside for exploring the island � including the magic of Stone Town�s bustling streets and night market � and at least double that for drinking in the sheer calm of the northern tip of Zanzibar. Flanked to the east and west by busy � albeit beautiful � beaches, Ras Nungwi Beach Hotel is nestled on a rocky outcrop overlooking one of the most pristine stretches of coastline in the world. And whether you�re lolling on one of the hammocks or simply lounging in your suite or on your patio, the smells and sounds of the sea are intoxicating and ever-present. Here, time stands still, and after a while everything seems to be in slow motion. No rush, no urgency, no frenetic party atmosphere � just the luxurious simplicity of the sublime offering at this landmark hotel. In terms of facilities, Ras Nungwi has it all, and despite its remote setting, you can enjoy everything from a floodlit tennis court, free WiFi areas and watersport on tap, to lavish meals prepared with the freshest of ingredients. Chef Herbie van Schalkwyk, who hails from the South African winelands, takes great pride in securing top wines for Ras Nungwi�s winelist, and he more than matches it with his exceptional culinary skills. While seafood forms the bedrock of the menus here, there�s no skimping on meat dishes and every day has its own tailormade line-up of mouthwatering meals catering for just about every taste. The accommodation comprises a range of suites of varying sizes (including sea-view chalets and garden lodge rooms), differing ever so slightly in their proximity to the beach, and all rooms are remarkably large for a beach resort, and boast the kind of modern bells and whistles one would expect from a top-notch establishment. 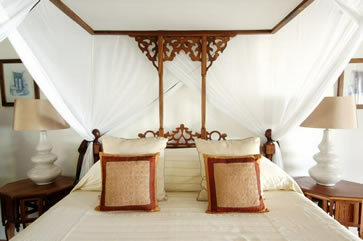 Four-poster beds, crisp cotton linen and beautifully carved furniture complete the picture. With watersport being a main drawcard, it�s no surprise that Ras Nungwi once again delivers in spades, and the diving centre on the premises offers everything from serious diving excursions to daytrips to nearby smaller islands, as well as sea kayaking and sunset cruises. 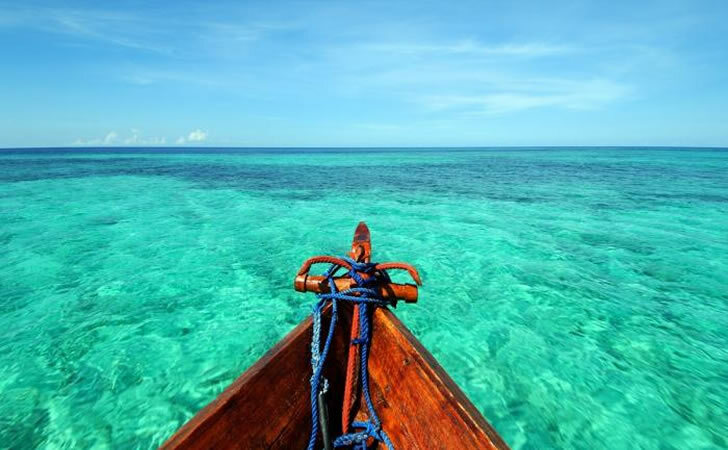 Be warned though � pack swimwear for the latter, because once you�re surrounded by azure water and the skipper offers you a snorkel and diving goggles, you won�t be able to resist. 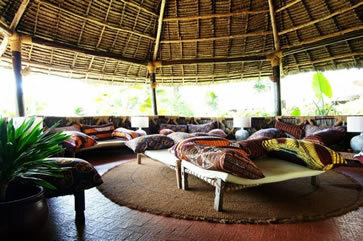 It seems that within a couple of days, guests at Ras Nungwi find their own rhythm, and it�s usually a slow one. And once you�re hooked on the sounds of water lapping on the beach and spending delightful hours doing absolutely nothing, you soon lose track of time. Which makes departing all the more difficult � whether it marks the beginning of a safari or the end of your holiday. 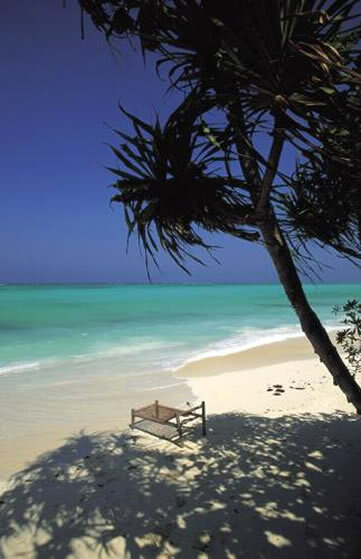 Ras Nungwi is the perfect base for exploring Zanzibar, and tours to Stone Town (less than a 60-minute hop) � as well as other parts of the island such as Prison Island and Jozani Forest - can be organised. Setting A cluster of whitewashed and palm-thatched cottages nestled on Zanzibar�s most northern peninsula � surrounded by spectacular stretches of coastline and lush tropical vegetation. Why you'll love it The peace and quiet, attention to detail and the fact that there are no hordes. The coast is clear of big vessels and yachts and it�s like a private slice of paradise � right on your doorstep. The live music offerings at dinnertime can be absolutely beguiling, and even better than some of the best gigs in Stone Town. Good to know The hotel operates on a bed-and-breakfast basis, with half-board and full-board options at a nominal surcharge. There�s a public computer with Internet if you need to check email, as well as free WiFi in designated areas. There are no televisions in the rooms, which can be startling at first, but soon it�s a relief as in blends in perfectly with the laid-back atmosphere. Wow factor The setting. 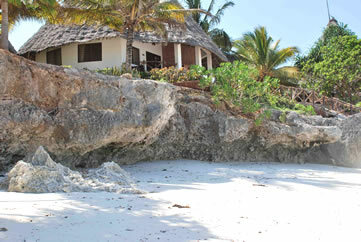 While other hotels on the island�s popular northern reaches are all set close to each other, Ras Nungwi enjoys pride of place in a totally secluded setting. Best rooms or suites to book The Ocean Suite is the epitome of decadence and even has its own private walkway to its own private beach. Consisting of more than 200 square metres of luxury, it has a plunge pool and a coveted rooftop terrace � complete with ultra-comfy daybeds. Room for improvement The bathrooms are practical yet small, although it�s completely understandable that there are no baths (the hotel is extremely eco-conscious and set in a water-scarce area). Since we visited the bathrooms have been fully refurbished. 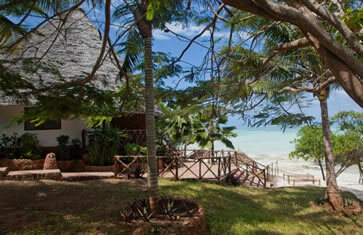 Rates From US$110 per person, including bed and breakfast. How to Get There Fly directly into Zanzibar�s Kisauni International Airport, or catch a connecting flight on one of the many regional airlines from Dar Es Salaam�s Julius Nyerere airport. Return flights from Dar can cost as little as $60 and comprise a mere 20 minutes journey � but be sure to confirm from which terminal you�ll depart as most local flights operate from the second one which is a short taxi ride (approximately $6) from the main building. Travel Services Transfers to Stone Town and other parts of the island are available on request, and journeys are approximately 60 minutes per trip. The transfers are in comfortable, air-conditioned minibuses and cost $80 per bus for up to four people.